Gearbox Software has a problem, and the problem is called Borderlands. While you may view their most successful franchise as a good thing, the fact is that it has become the yardstick by which their future products will always be measured. And, let’s be honest, they’ve produced nothing since Borderlands that’s particularly noteworthy, unless it’s more Borderlands. The undeniable and terribly inconvenient truth is that Borderlands’ initial success was largely a happy accident. Check the original review scores of the franchise’s first release and you’ll see that it wasn’t all glowing praise – but rather it had that (apologies for using this term) “cult appeal” that made it inexplicably popular very soon after people stopped bothering to criticise it. The second game was stronger, its DLC was mostly excellent, and the subsequent Pre-Sequel rode the coattails admirably. But it was lightning in a bottle. The humour was almost exactly spot on, and the sum of its parts was something quite brilliant, as its clumsy, irreverent charm masks its flaws, and its characters sell the universe its set in with charismatic ease. 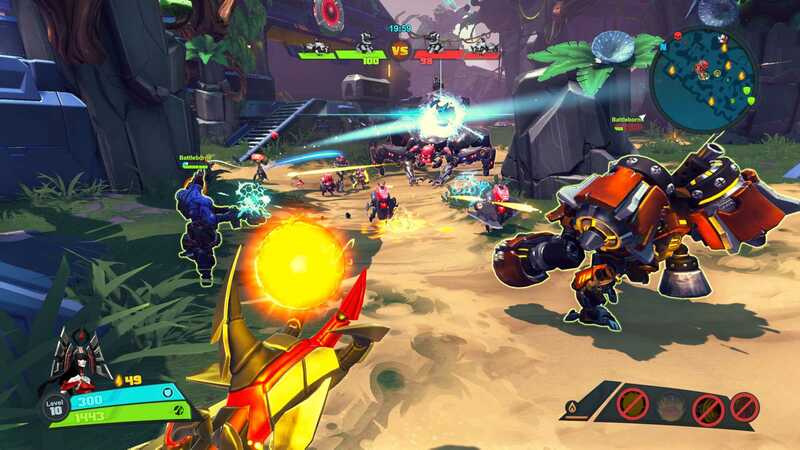 The problem with Battleborn is that it desperately wants to be Borderlands, and misses the mark on most of time in doing so. After sitting through a lengthy anime opening that’s all noise and bombast for no real reason, you’re dropped into the Prologue as Mellka, one of the 25 unlockable characters. There’s some background dialogue about a defecting agent who’s planning to sell out a villain called Rendain, an unlikeable douche who is leading a genocidal war to lay claim to Solus, the universe’s last living star. Beyond that I struggled to really understand what was going on, as all the exposition is given while you’re shooting things, and before long I reached a boss battle against the same giant spider tank thing you’ll face variations of for the next eight missions and decided I’d push on, hoping for clarity later. Sadly, I didn’t get it. 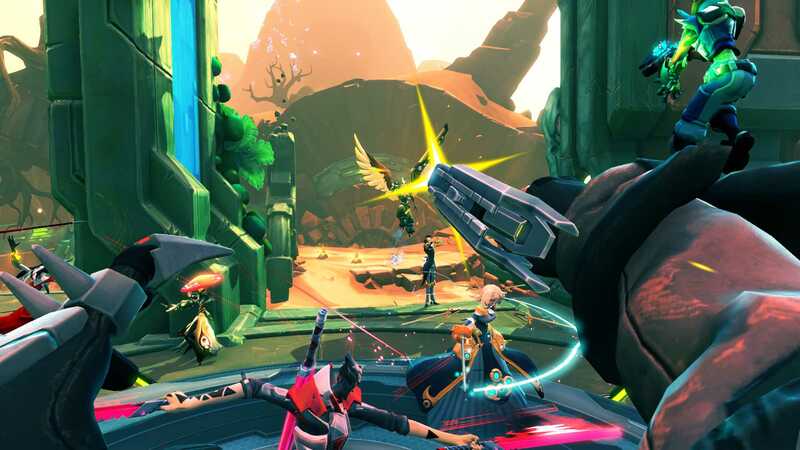 You see, Battleborn’s campaign is incredibly unforgiving to solo players. There are certain missions – all of which go on for way, way too long – that require you to hold off swarms of enemies and defend several weak points at once, and you need to be incredibly skilled to pull it off. It’s easier then, you’d think, to jump into the cooperative multiplayer and play the Story online. Well, yeah, that makes the missions more digestible, certainly more achievable, but you have to vote for one of three random missions every time and can’t simply pick the one you want, and they don’t unlock for campaign play unless you finish them in the campaign. It’s a mess, quite frankly, and meant that aside playing with my colleagues who were also playing it, I had to push through the already weak story in no particular order. Thankfully, the actual gameplay is pretty decent. Weapons have a decent heft and impact, and melee-centric characters like Rath and Phoebe can hold their own even during intense firefights – but sadly there’s little explanation as to what he characters are, what their powers do or where they got them; if you want to know, you’ll have to play as that character, which often means you’ll have to unlock the first. That’s not a problem in itself as it means you’ve always got something to shoot for, but it will take most people an awfully long time to unlock everyone, by which time you may well be fully attached to two or three core characters and won’t bother switching. Leveling your characters works well, though. Each has a unique 10-level Helix, and you begin every mission at level 1. Each time you gain a level, you open up another branch of the Helix and can choose either of several skill adapters. These might be damage modifiers or increases to skill duration, but they can make a real difference to how you play a character. Earning XP is quite easy, too, as it’s awarded for kills, building turrets and defences using collectible shards as currency, and completing objectives. You’ll usually reach level 10 in a given mission. 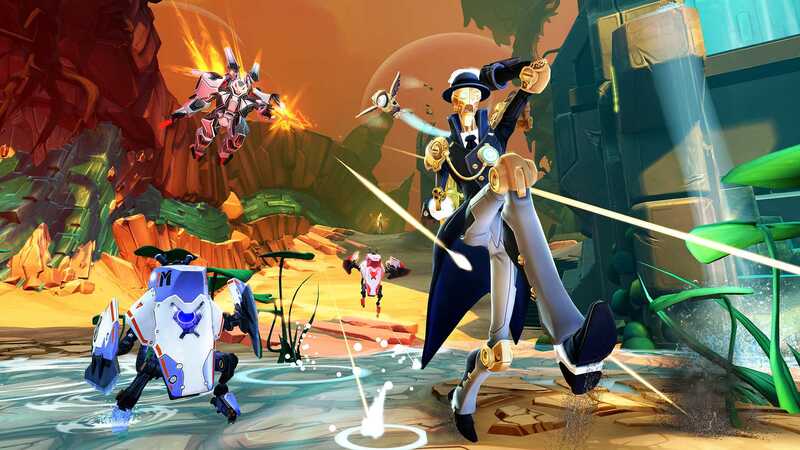 What Battleborn does do well is the competitive multiplayer. Very much a MOBA, it invites you take part in any of three 5v5 modes: Capture, Incursion, and Meltdown. All three involve the player teams going head to head with each other and a variety of bots, either allied to one team or hostile to all, to complete objectives. Of the three, Capture is the simplest, a take on Zones that sees you holding points A, B, an C longer than the enemy. Incursion and Meltdown throw different elements into the mix (Incursion, for example, tasks you with breaking the enemy defence to defeat their armoured Sentries before they defeat yours). The maps work pretty well on the whole, with some great vantage points, choke-points, and killing grounds, but in this early stage the players who are used to Halo and Call of Duty still go after kills before objectives. In fact, a straight team deathmatch mode probably would have been a welcome addition. Of course, the online modes do call into question some of the character balancing. The time to kill is incredibly high on some characters (and the 30-second respawn is utterly infuriating, as is the prolonged wait before a match starts), and there are a few who simply won’t go down if they get you alone. There’s such a mix of skills that learning them all will take time, but it’s almost essential if you want plan effective strategies on the fly. The melee characters in particular feel somewhat overpowered against the ranged fighters unless the ranged player is a crack shot. Try taking a charging Phoebe out with Marquis, for example – it’s not easy, and doesn’t feel particularly even. Balance teams may be the answer, but some maps just aren’t designed for long-range play and there’s little point having a sniper character who still takes a minimum of three or four headshots to kill an enemy player. But these days balancing issues are patched later, and it’s early doors for the game in general, meaning there’s still a lot of playing around to do before most people are proficient with more than a handful of avatars. Luckily, there are ways to improve your chances, thanks to “Gear”, equippable items that can trigger bonuses to damage, defence, skill cooldown, movement speed, and a dozen other attributes that can really help turn the tide in a pinch. They’re collected the same way power ups are, scattered on the ground like colourful confetti that gets the inner lootholic in all of us in a constant state of near-euphoria. If Gearbox learned anything from Borderlands, it’s that people need loot. We love it, and we’ll forgive a great deal of shortcomings if you keep piling on the shiny-shiny. If this all feels terribly negative, then I should clarify that Battleborn is not a bad game at all. But it is a game that doesn’t always seem sure of what it wants to be. The characters feel like a bunch of designers stayed up later drinking Monster and eating Mentos and then threw a load of ideas in a hat, but by and large they do work. They’re colourful and eclectic and just eccentric enough to remain interesting, although you have to work for it, some of their skills are incredibly creative, and learning to use them at the right time and in the right situation can be the key to victory. The writing, however, is excruciating at times. Characters like Rendain and Kleese are hugely irritating, while others like Nova feel recycled from somewhere else without keeping the good bits. There’s a distinct lack of charisma in the dialogue, which isn’t helped when almost every character is set to Sarcasm Mode and won’t switch into anything else. Eight out of ten jokes fall flat, and the ones that hit the mark don’t produce more than immature chuckles. Bereft of characters like Handsome Jack, Torgue, and Tiny Tina, it all feels a bit try-hard. 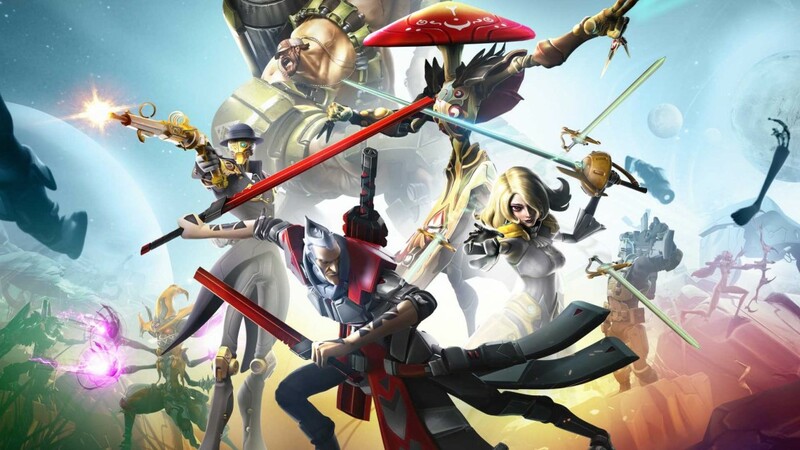 You can’t fault Gearbox’s enthusiasm, ambition and effort, and the amount of content puts many other games to shame, but Battleborn may be a grower rather than a show-er, and with such high competition in the market, that’s probably not going to do it any favours. That said, if you can look past the cringe-worthy dialogue and slight balancing issues, there is a decent team shooter underneath that will have you experimenting and learning for hours, and keep you occupied unlocking characters, skins and emotes for weeks. Review code provided by publisher. Xbox One version also tested fully. An ambitious team shooter that struggles with its identity and is let down by a weak script and try-hard comedy.